Thanks, edna. It isn't my husband who's like that, it's my mother-in-law. She has early stage dementia now, but for years, she has been a negative person, or at least puts that energy out. If it's sunny, it's "too bright", if it's raining, then "The day is ruined" etc. We all feel like that at times, but if it's constant, it's not healthy. Good luck Jenny. I've had jobs I've been warned about that have turned out to be great - you're right that everyone has a different experience. You get a fresh start without any negatives about the job. That's good stuff. Make it your own. Good luck Jenny!....And my work is telling me I will be taking one of my residents to Atlantic City in June, all expenses paid for...Even though it's a big responsibility looking after a resident, I'm sure he appreciates that I am taking him and will enjoy the trip....I'm looking forward to enjoying the sites also. AC in June...that's nice. I hope you get some time to enjoy yourself on that trip. Coke Classic + Coffee: BUZZ! Got to vote today and feel like it mattered. Usually by the time CT rolls around, these things are decided. Howdy yerself....how are you kid? jes' fine. ;-) I heard there was spamalot here, so I came to see what I could round up. I'm having a rough time making my way through these boards... not used to 'em. The PGA Championship is being played at Baltusrol this weekend. That is about one mile from my house. 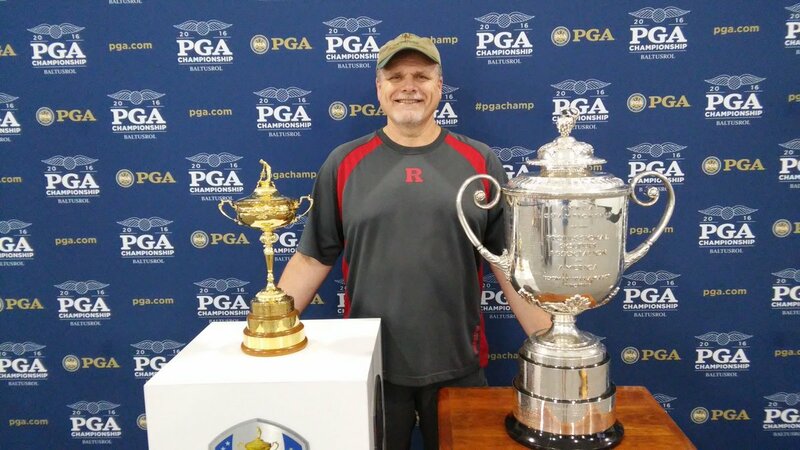 I got a chance to pose with the Ryder Cup and the Wanamaker Trophy. If you watch any golf this weekend...that's my neighborhood. My Ron, what a large.... trophy you have there. Why thank you my dear. The better to...see you with. Tim Urban came to my town tonight. Not the guy who does the Ted talks, but the fellow who finished seventh on American Idol Season 9 (the one with Ellen DeGeneres). I always wonder what it's like to be an Idol contestant who didn't make it big. 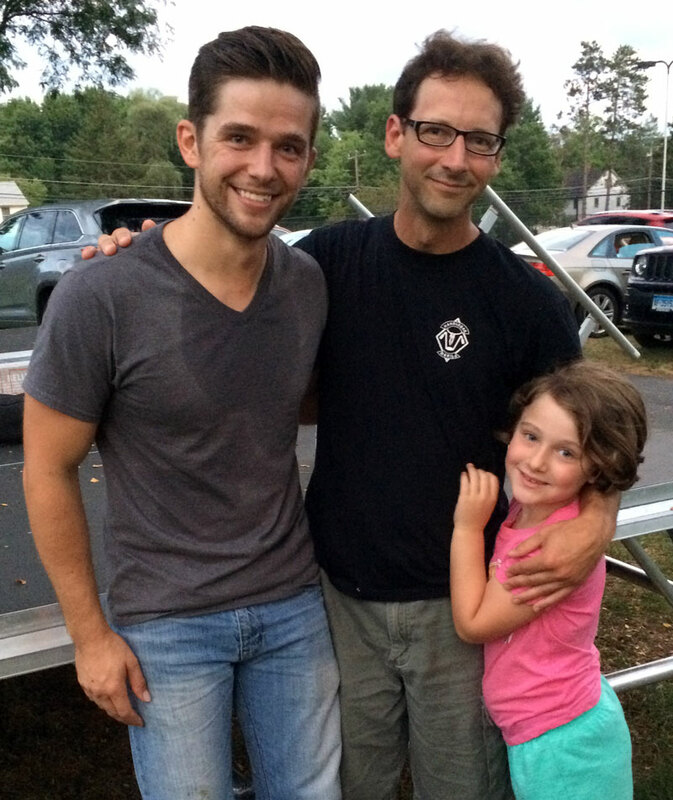 In Tim's case, the show was all gravy. He auditioned to shut up his friends, and somehow made his way to the Top 10. This got him on the Idol tour, which took him all over America. It's a triumph of expectations. He seemed thrilled to be playing our little town, and did a terrific set. He's got a bunch of brothers and sisters (two in the military) and apparently they all play music. One of his sisters (Abby, I think) joined him on stage a few times. Was good to see someone in it for the love of the game. Jeez, Carl, grow your hair longer and take off the glasses and you could pass for Roger these days. I head out on vacation for a week starting tomorrow.!!!!! Watch out for Florida Zika Mosquitoes!